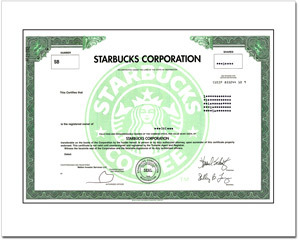 Starbucks Corporation was founded in 1985 and is based in Seattle, Washington. Starbucks primarily purchases and roasts whole bean coffees and sells them along with brewed coffees, Italian-style espresso beverages, cold blended beverages, a variety of food items, coffee-related accessories and equipment, a selection of teas and a line of compact discs, primarily through Company-operated retail stores worldwide. Starbucks also sells coffee and tea products through other retail outlets. Now that you own the company, May Your Cup Always Be Full!